Boker Plus Tomahook – Tactical Tomahawk. 18 1/8″ overall. 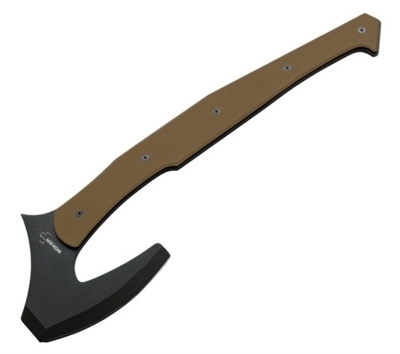 SK5 carbon steel black finish axe head with 5 5/8″ cutting edge. Textured tan G-10 handles. Molded black Kydex blade cover. The “Tomahook” design is inspired by the Celts, Vikings and Native Americans, offering a high degree of functionality and versatility. Highly effective as a hatchet, with its wide, sharp edge, it can also be used as a lever, as the top of the ax head is sharpened like a chisel. The back of the ax head has a rounded point of impact, which is ideal as a glassbreaker or pounding tool.